Coverage: Live commentary on BBC Radio 5 live and sports extra, BBC Radio Wales and in Welsh on BBC Radio Cymru, plus live text commentary on every match on the BBC Sport website. 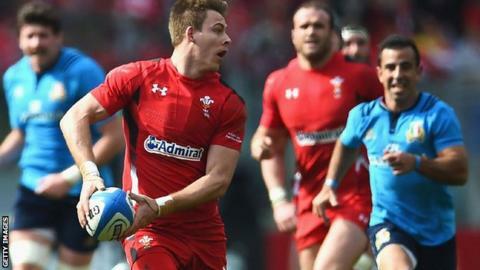 Scarlets coach Wayne Pivac is confident Wales will not push Liam Williams into action too early following Leigh Halfpenny's World Cup withdrawal. Toulon's Halfpenny is out of the tournament with knee injury sustained in the 23-19 win against Italy. Williams is favourite to start the tournament in his place, but has not played since foot surgery in June. "They're going to do what's best for the team and the individual," said New Zealander Pivac. "They're not going to push anyone too early because you don't get any rewards out of that. How are the home nations looking? "I know they'll be doing a fantastic job with Liam and other players who are recovering from injuries." Williams, 24, has made 23 Wales appearances split between wing and full back, but Pivac believes that he offers more when playing in the number 15 shirt. "Wales are blessed with having two great full backs. But something always seems to happen around Liam when he plays there," he added. "I'm looking forward to seeing him play because personally I think that he's a very, very good player." Pivac also believes that Gareth Davies has the qualities to take Rhys Webb's place in national coach Warren Gatland's team after the Ospreys scrum-half was also ruled out of the World Cup with a foot injury. Davies has been a prolific scorer for Scarlets, claiming 10 touchdowns in the 2013-14 season to top the League's try-scoring table. "He's very similar to Rhys Webb in his running game and his strength around the fringes," said Pivac. "His history shows that he'll be up for it and he'll love the challenge and he won't let anyone down." In Halfpenny, Wales have also lost a player who can play on the wing. Newport Gwent Dragon Hallam Amos is similarly versatile, while versatile Matthew Morgan, of Bristol, and Bath's Rhys Priestland also have full-back experience. "He was probably the form left-winger in Wales last year but, looking at the future, we (Dragons) probably see him as a full-back," said Connor. "The back three these days are very interchangeable. "It's a similar skill-set for both positions. Hallam has the capabilities to play both. "He's bouncing that he's made the World Cup squad. "He's one for the future but also he's one for now." Props: Tomas Francis (Exeter Chiefs), Paul James (Ospreys), Aaron Jarvis (Ospreys), Gethin Jenkins (Cardiff Blues), Samson Lee (Scarlets). Hookers: Scott Baldwin (Ospreys), Ken Owens (Scarlets). Locks: Jake Ball (Scarlets), Luke Charteris (Racing 92), Dominic Day (Bath), Bradley Davies (Wasps), Alun Wyn Jones (Ospreys). Back-rows: Taulupe Faletau (Newport Gwent Dragons), James King (Ospreys), Dan Lydiate (Ospreys), Justin Tipuric (Ospreys), Sam Warburton (Cardiff Blues, capt). Scrum-halves: Gareth Davies (Scarlets), Lloyd Williams (Cardiff Blues), Mike Phillips (Racing 92). Fly-halves: Dan Biggar (Ospreys), Matthew Morgan (Bristol), Rhys Priestland (Bath). Centres: Cory Allen (Cardiff Blues), Jamie Roberts (Harlequins), Scott Williams (Scarlets). Wings: Hallam Amos (Newport Gwent Dragons), Alex Cuthbert (Cardiff Blues), George North (Northampton Saints), Eli Walker (Ospreys).